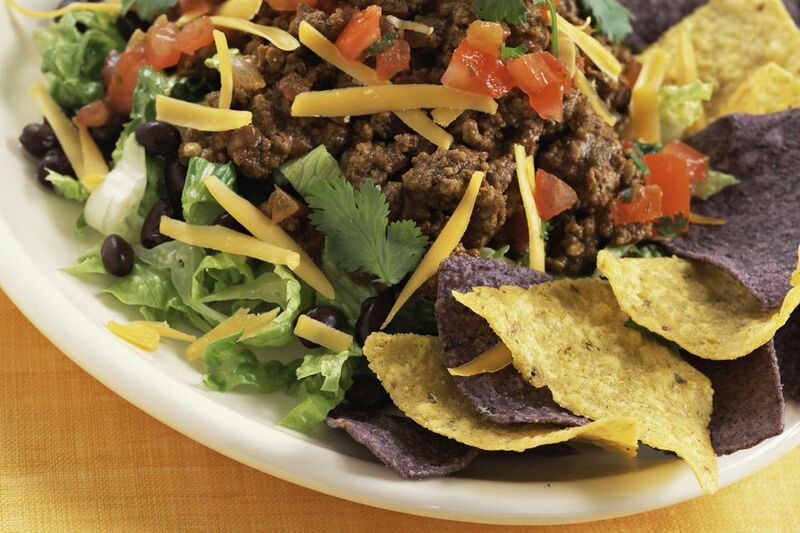 This simple taco salad recipe uses ground beef, lettuce, shredded cheese, tomatoes, ripe olives, and corn chips, along with taco sauce, plus other ingredients. See the tips and variations for a quick taco sauce recipe and how to make your homemade tortilla chips, baked or fried. In a heavy skillet, over medium, heat the ground beef, stirring and breaking up, until the beef is no longer pink, but is brown. Drain off excess fat. Sprinkle the taco seasoning mixture over the beef and mix well. Stir in hot sauce. In a large bowl, combine shredded lettuce, shredded cheese, tomato, olives, and green bell pepper; toss. For each serving, place lettuce mixture on a salad plate or bowl, top with some of the seasoned ground beef and garnish the taco salad with taco chips. Alternatively, the salad may be served atop taco chips or in a taco shell "bowl." Serve with taco salad with taco sauce, if desired. Baked Tortilla Chips: Heat the oven to 400 F. Cut corn tortillas into quarters and lay on a baking sheet in a single layer. Season as desired and bake for about 6 to 9 minutes, until crisp. Fried Tortilla Chips: Heat the oven to 350 F. Place corn tortillas on a baking sheet. Bake for about 5 minutes, or until dried. Cut them into quarters or sixths. Heat about 1/4 inch of vegetable oil in a skillet over medium-high heat. When the oil is about 350 F, place several tortilla pieces in the oil. Don't crowd. Fry for about 2 minutes, then remove to a paper towel-lined plate to drain. Repeat with the remaining tortilla pieces. Homemade Taco Sauce: Combine an 8-ounce can of tomato sauce with 1 tablespoon of cider vinegar, 1/2 teaspoon of chili powder, 1/2 teaspoon of ground cumin, 1/2 teaspoon each of onion powder, garlic powder, and sugar, and a dash of cayenne. Taste and adjust seasonings. Add a few tablespoons water to thin, if desired.